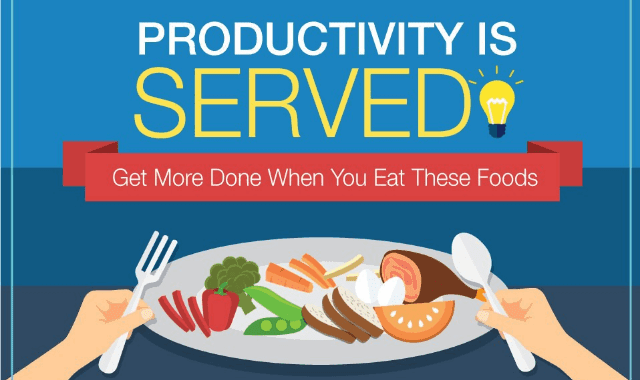 Productivity is Served: Get More Done When You Eat These Foods #Infographic ~ Visualistan '+g+"
In between meetings, a constantly filling inbox, and fast-approaching deadlines, quick and easy snacks and lunches may be the go to. But unfortunately convenience food isn’t always the best for us. Unhealthy choices—including processed foods, sugar, and fried foods—can negatively affect alertness, focus, concentration, and overall brain function. Antioxidant- and vitamin-rich foods, however, can directly boost productivity. Some foods have even been shown to help facilitate mental processes such as negotiation, focus, and willpower. The following infographic details foods known to make us more productive at the office. Bring on the blueberries!